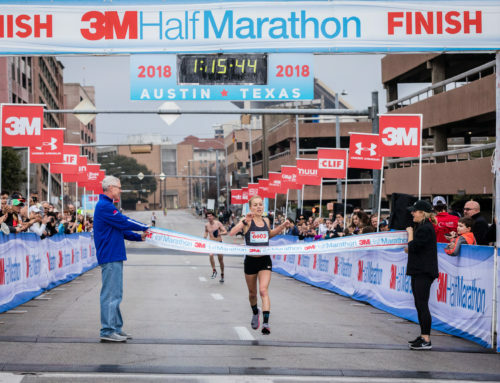 The Austin Marathon/Half Marathon is going to be here before you know it. If you’re one of the 17,000 who are running, this final week will feel like it drags on forever. But trust me on this one: Marathon Sunday–February 15th–is right around the corner. If you’re new to marathoning, this translates to starting the race at too quick a pace. If you do, it will make the last few miles an ugly struggle, a death march to the finish on Congress—the last thing you want. But assuming you’ve trained well, done all the long runs and have plans to rest up before the big day, you should do just fine with just that one caveat that bears repeating: Don’t start either race too quickly. Stay positive for the next several days and don’t make any last-minute training changes/blunders. There isn’t any workout you can do between now and Sunday that will make you any stronger, fitter or faster so don’t even try to get one last hard one in. If you can be patient and trust your training, you will make it all the way to the finish line on Congress. One of the best ways to get to the finish in good shape is to break the marathon up into manageable segments. Don’t think of it as a 26-mile race. Instead, split up Austin into smaller, easy-to-chew chunks. Settle down and settle in. The first few miles of Austin are just a warm-up. Make certain you line up correctly near a sign that refers to the expected mile pace you’re planning on running. Once you hit the starting line, begin running. All you really want to do is find some open running room and get into your proper marathon pace. 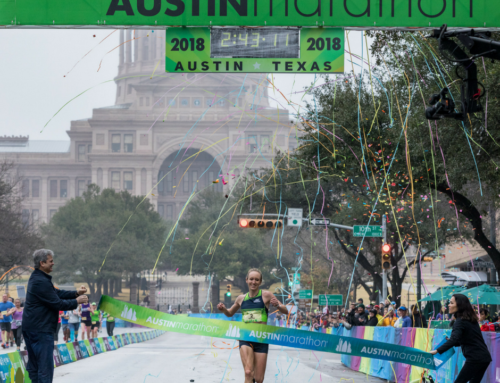 The first few miles south on Congress will be very congested, and if you’re a few seconds slower than you want to be at the first few mile markers, that’s no big deal. What is not OK is starting too fast. The first three miles are the hilliest part of the race (the long, gradual climb on Congress) so control the adrenaline rush and settle down. Try to get up and over the first uphills going south on Congress as easy as possible. Relax on the steep downhills along South 1st, rather than push it. Don’t trip. Just like you, everyone else is pumped up and can’t wait to get going. Once the race starts, runners will fly across the starting line—often oblivious to anyone else. This can be dangerous and you don’t want to get tripped and go down. Hold your arms out like an outrigger and fend off anyone who ventures into your space. Go cautiously in the first several hundred meters. Run to the outside on Congress where there’s more room than smack dab in the middle of all the humanity. Drink. You’ll hit the first aid station after one mile, just north of Oltorf. Drink. You won’t feel like it, but force yourself to grab a cup of water or Gatorade. You may have been standing around in the starting corral for some time and may already be dehydrated. Even if you’re not, start drinking now. It doesn’t matter whether you get Gatorade or water. Toss any extra clothes. It will probably be chilly at the start (low 40s) and if you have worn gloves or an extra shirt to keep you comfortable while waiting for the start and are beginning to feel warm, get rid of any extra clothing now. Tune into the crowd. Accept the cheers of the spectators who will be downtown, but don’t spend a lot of time high-fiving everyone. You haven’t earned it yet and can’t afford to waste any energy now. Relax. You’ll be out here a while, so chill out. You only have one thing to do for the next several hours and that’s move steadily to the finish. There should be nothing else on your mind except getting to the finish line. Shake out your arms, roll your head and go with the flow. Adjust. If anything has gone wrong (too fast, too slow, too hilly, missed your water), you still have plenty of time to make any adjustments. By the time you recross Lady Bird Lake (around 6 miles), you should feel good and in control. Cruise control. After the initial ups and steep downs in the first two or three miles, you should have settled into your steady marathon goal pace. Maybe you’re running with a pace group which should help you stay right on pace. Put it on cruise control. Don’t think about anything, other than enjoying yourself, the day and the feelings you’re experiencing. 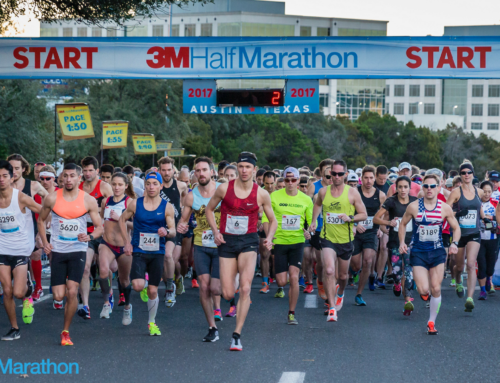 The stretch from City Hall to Hula Hit along Cesar Chavez and Lake Austin Boulevard (miles 6 ½ -10) is the flattest section of the course. Don’t go to the bank. A common mistake many marathoners make (especially beginners) is to think they can “bank” some time early on in the marathon. This is especially true of Austin which has a couple of downhills in the first eight miles. Banking time means to run a minute or two faster than goal pace while you’re still feeling great and then if you have to slow down later on, you’ll have some time in the bank. Funny how it never seems to work out that way. If you bank now, you’ll pay for it later. For every minute you run faster than your goal pace in the early, hilly miles, you will lose about two minutes later on. Avoid the temptation to bank. It never works. Pack mentality. Running with a pace group or pack that is running at a similar pace is the best way to go. You spend less energy thinking about proper pace. Plus, it’s easier to run the proper pace with a group (assuming the group is on your pace) because of the strength in numbers. Also, a pack can fight through the wind better than you can by yourself. (Final miles of half marathon, miles 10-13.) There will be four times as many half marathoners (12,000) as marathoners. The course is the same for the first 10 ½ miles, but on Enfield the marathoners leave and make the long climb up Exposition, while the half marathoners also begin their long climb up 15th Street to the Capitol. The one-mile stretch between the 11th and 12th mile is particularly grueling, especially the monster hill that looms large, just past Lamar. But once that is ascended, it’s pretty much clear sailing to the finish on Congress. Mercifully, the tricky San Jacinto hills are not part of the half marathon course this year. Halfway home? Logic would tell you that the 13-mile mark of the marathon on 41st and Bull Creek just past Camp Mabry is halfway. Logic would be wrong. Halfway is 20 miles. The 13-mile mark is just another mile marker, but it’s a good one to make absolutely sure you’re on pace. There are only 13 miles left to run, but those will be the hardest miles of your life if you’ve started too fast. Monitor how you feel. These middle miles can be deceptively tough. Your body is beginning to bark back and your mind may be wandering. That’s natural. Here is where some negative thoughts can creep in. Allow the thoughts to come…and then go. Don’t hold onto them for more than a minute or two before getting back on task. Maintain pace. It is tempting to allow the pace to drift here (especially on the long, gradual uphills (Shoal Creek and Great Northern) to Northcross Mall), but try to maintain an easy, efficient stride and steady pace. If you need to, shorten your stride slightly. Never lengthen it. Use your arms more. Try to keep your jaw and upper body relaxed. Continue drinking and taking in nutrition. If you are using energy gels, make certain you are consuming them early enough in the race so they’ll help later on. One last energy gel. Now’s the time. Make an alliance. You’ve probably been running with someone from your pace group for many miles. Talk it out and encourage each other. Try to stay together as long as possible to pull each other along. Heading south. The Austin course finally makes the turn toward downtown (south) just before 19 miles. Most of the tough uphills are behind you. Keep moving. You’ll be very tired and it’s tempting to walk. Focus on moving forward. Use your arms, place one foot in front of the other, lean forward and move steadily toward the finish line. Never stop. Focus. Your mind may be a little muddled, so try some mind games to get your focus back on track. Do some simple math problems. Or count the weird T-shirts you see. Or pay attention to the odd costumes aid station volunteers are wearing. These thoughts will be fleeting. Get going. This is crunch time. There are only a few miles of running left as you cruise down Red River (mile 23) and the gradual downhill which is Duval (mile 24) and then through the UT campus, but it can feel like an eternity. (Watch out for a short, but nasty uphill on 41st which brings you up to Duval.) The finish on Congress isn’t far away now, but you aren’t quite there yet. Try to maintain your composure and go from the 24-mile marker to the 25th on San Jacinto to the 26th. If that’s too hard, go block to block. Endure. You’ll only have to put up with this supreme fatigue for a little longer. You’ve put in hundreds of miles of training. You can do this for another few minutes. The final tricky part of the course begins as you pass Scholz Beer Garden on San Jacinto in the final mile. San Jac is tough as it gradually climbs, levels out and then climbs one more time, just past the Capitol on your right. Watch out for the final two little uphills near the top. Don’t ease up. Once up and over the infamous San Jac hills, you’re almost done. Fortunately, the race finishes on a gentle downhill on Congress. You can hear the finish-line announcer calling out the finishers’ names. Now’s the time to give it everything you have left. Now’s the time to look good for the crowd, your family and the cameras. Wave, celebrate and drink in the moment of your supreme accomplishment.